If you're an X-Plane user and a member of the BVA community, sometimes you might feel like BOS_DEL during CTP west-bound. 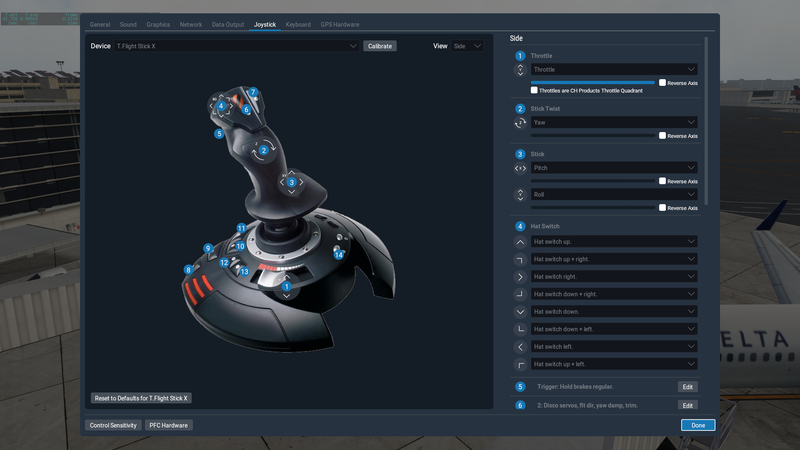 Everywhere you look on the forums, all people are talking about is P3D. The pilot resources software section doesn't mention X-Plane and the required software download section doesn't either. I think X-Plane is an absolutely great simulator with far superior flight model and beautiful graphics that do not require you to play on a computer from NASA. In this guide I will try to show you the wonderful world of X-Plane and give you an alternative to P3D. Where to buy and for how much? You can buy it from the X-Plane website through a digital download, a DVD or a flashdrive that will be sent to your home, or (most preferably) on Steam. Both X-Plane's website and Steam currently list it for $59.99 but the lowest it got was $39.59 during Steam's Summar Sale in June 2018. The reason I prefer XP11 on Steam is that it allows you to get instant updates and you can easily download all global sceneries through Steam's DLC system for free! This lets you have all the landmasses, runways and airports for all airports in Africa, Asia, Australia, Europe, North America and South America. This of course doesn't include actual airport buildings, etc. but it does include roads, coasts, mountains and generated buildings and trees. Basic file structure and how to install addons. 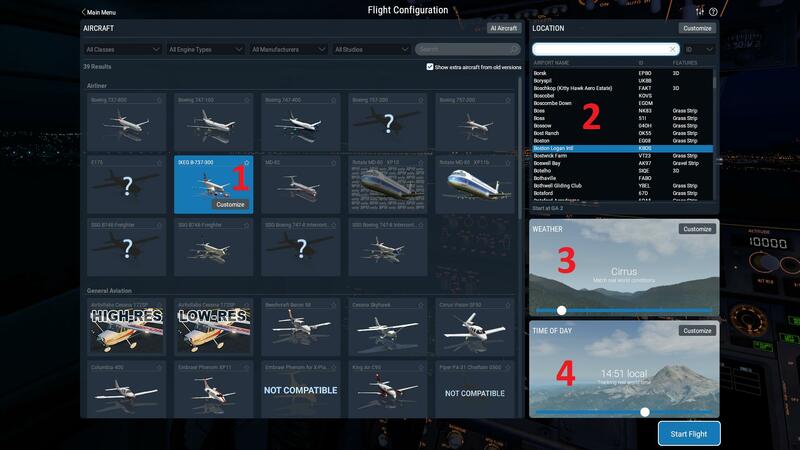 In your main X-Plane 11 folder you will see 3 important folders: Aircraft, Custom Scenery, Resources. All your aircraft go into ... /Aircraft/*. What are some must have addons/plugins/libraries? Autospeed - If you use X-Plane on the network, a potential issue can arise due to the design of the program. If you start to experience an FPS below about 20, X-Plane automatically "slows you down" in order to keep the visual performance "smooth". However, when this happens, your simulator rate actually reduces, and it will be challenging for ATC to sequence you with other traffic. 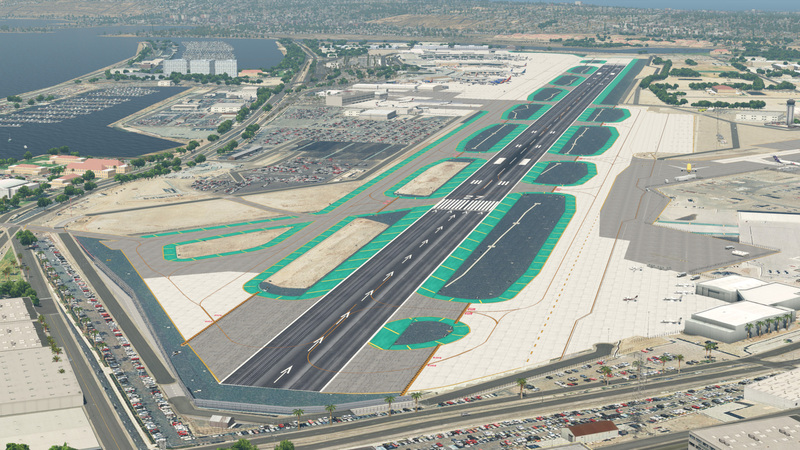 To prevent this issue, we recommend all X-Plane users download and install this plug-in before flying on the network. 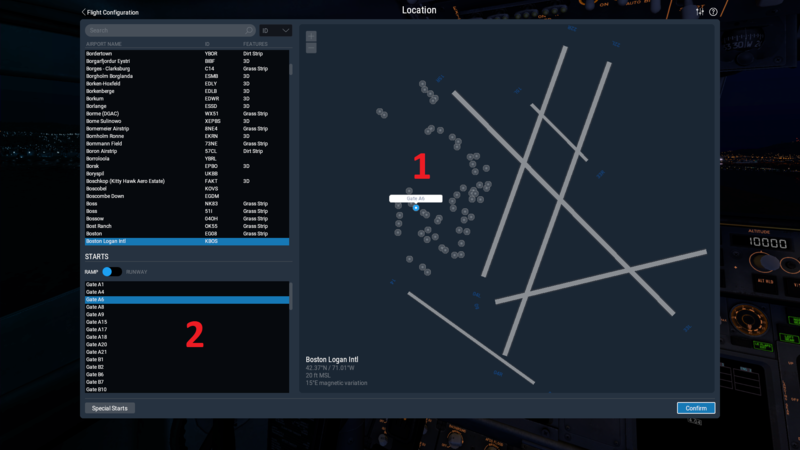 Model Matching - X-Plane uses CSL (model matching set) files in order to depict and generate other aircraft when you are flying online. BVA recommends this Bluebell package, which includes 80 aircraft types and approximately 1,800 liveries. EZPushBack - This is a simple pushback script that has a forward/backward push functionality and you can steer the aircraft with rudder control. Most aircraft come with their own pushback systems but some don't so it's good to have a handy, simple script. FlyWithLua - it is a "base plugin" that other plugins can be built on top of. XPRealisticPro (Payware $19.99) - This plugins adds a lot of immersion with 30+ effects including shaking from speed breaks, stalls, props... There are engine vibrations effects, heading movements, sounds for reversers, wind drag, flap frag, gear drag, turbulence, g-forces, roll anticipation, ground effects, and more. This purchase is totally worth the money but I would wait with buying this one until you really get into X-Plane. 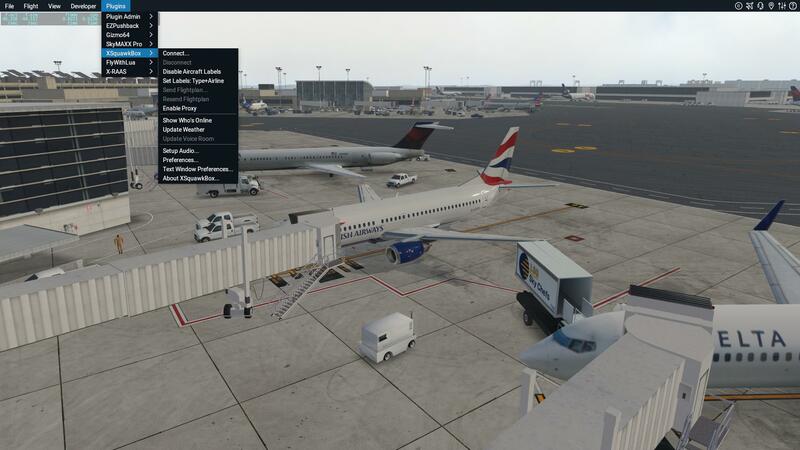 AutoGate - Sceneries developed using this plugin will allow dock jetways to your aircraft automatically based on the status of your engines and breaks. Next, object packs and libraries that almost all sceneries are built with. Simply throw these into your Custom Scenery folder unless instructions say otherwise. Of course you don't have to install all or even any of these, but as you're installing sceneries you will find that a lot of them list these as requirements. KBOS - Boston Logan International - an absolut MUST HAVE. This scenery is gorgeous, realistic and in my opinion the best KBOS in existence. 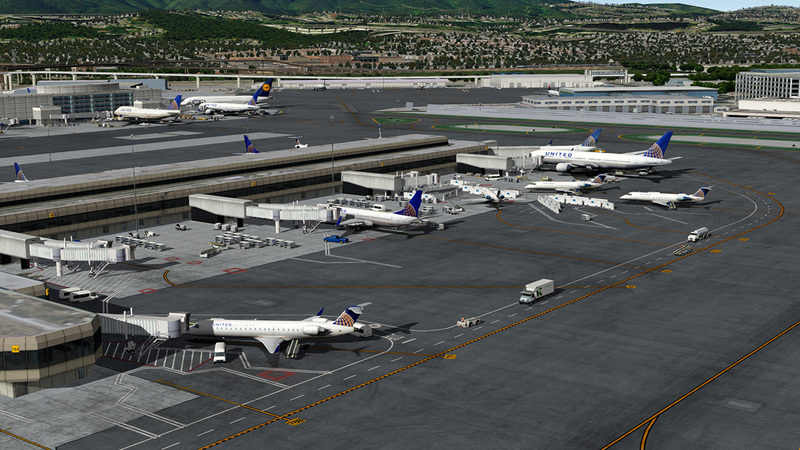 KSAN - San Diego International - Gorgeous airport with excellent city model around. CYYZ - Toronto Pearson International - great looking scenery from our neighbors to the north, perfect for a shop 1hr hop to Boston. Above sceneries are some of my favorite, very high quality airports. There's also a ton of great airports that maybe aren't as perfect as the above, but still good for flying. 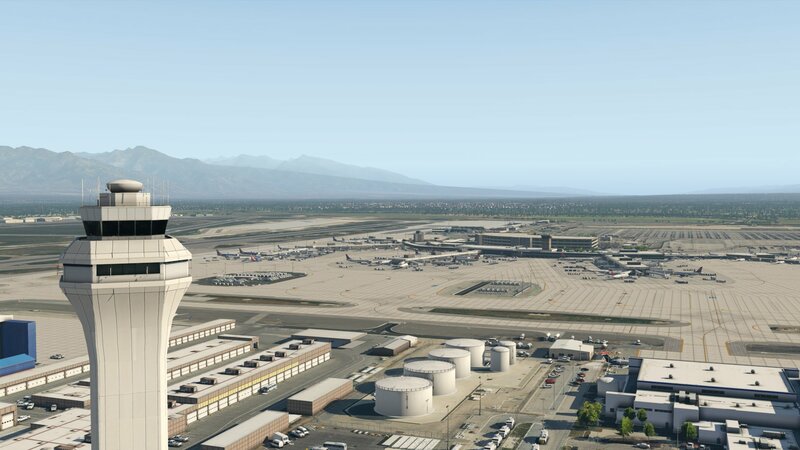 This list is by no means exhaustive, in fact there are hundreds of good looking, free airports for X-Plane. Some of them are: KMCO, KMIA, KIAD, KDEN, KMSP. 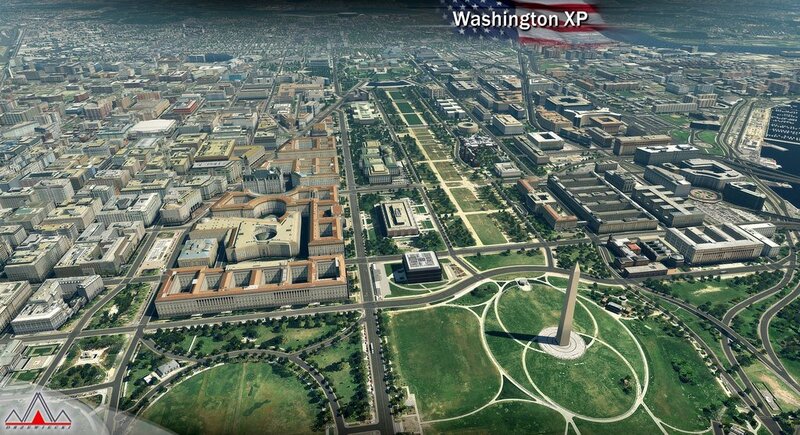 Washington XP (by Drzewiecki Design) - KDCA, KCGS, KADW, KVKX + the entire city of Washing D.C., the White House, Pentagon, Washington Monument, Capitol, and even Trump, Pence and Melania modeled inside a fully modeled Oval Office. This scenery is absolutely stunning and if you're getting your first payware scenery in XP, get this, you won't be disappointed. 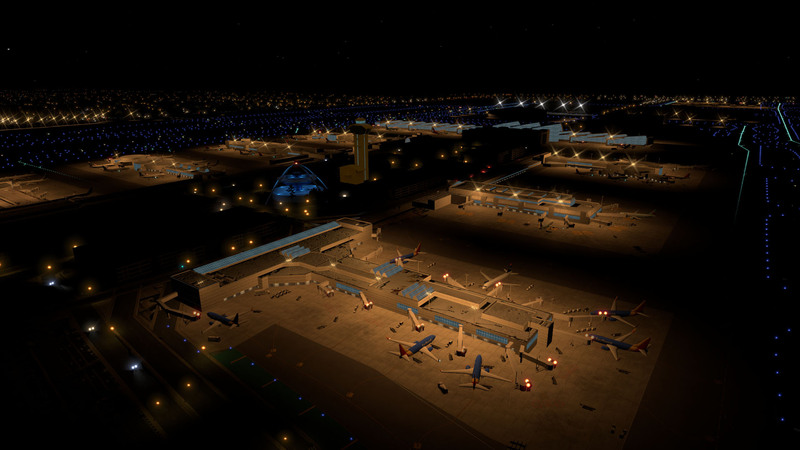 NY Airports XP + NYC XP (by Drzewiecki Design) - KJFK, KEWR, KLGA, KTEB, KCDW, KLDJ + New York City - This is your complete package for flying in the Big Apple area. It has all the major airports and a realistic New York City skyline full of skyscrapers. The FPS hit is surprisingly good for such a detailed package with multiple airports in close proximity. Definitely a recommended payware! TNCM - Princess of the Caribbean - Main island of SXM with detailed renditions of TNCM and TFFG. Experience the jetblast of Heavy Jets arriving to the famous Maho Beach. CYYZ - Toronto Pearson International - Accurate replica of Toronto International Airport, Pearson, in ultra-high definition. KDFW- Dallas Fort Worth - is the primary international airport serving the Dallas Fort Worth area in the U.S. state of Texas. KPHX -Phoenix Sky Harbor International - Arizona's largest and busiest airport, and among the largest commercial airports in the United States. And of course there are many more airports. I tried sticking to the United States but there are equally amazing free and payware airports in Europe, Asia and Australia. Here you want to check out places such as YSSY, PAJN, LOWW, YMML, LSZH, EDDM, LFKC, EFHK, OMDB, VHXX, SBGL, and hundreds more. If you're primarily interested in flying within our ZBW airspace, you might want to check out our separate thread dedicated to free, ZBW sceneries. Those include: ACK, ALB, ASH, AUG, BED, BGR, BHB, BOS, BTV, EEN, BDL, IWI, LCI, LEB, LWM, MHT, MVY, OQU, PQI, PVD, PWM RUT, SCH, SFM, SLK, SYR, and WVL. There are so many details and intricacies with aircraft that I will simply give you links to a (non-exhaustive) list of aircraft worth buying. There is a fantastic, free Boeing 737-800 modification that takes the default XP11 included 737 and elevates it to a payware level aircraft. Check it out here*. Additionally, Aerobask released their Robin DR401 for free to thank the community for their continuous support. It's a great GA aircraft that includes the brand new (and superb) Laminar Research G1000. Check it out here*. In general and from personal experience, I can recommend aircraft from Carenado. Check out their offer, they have discounts on some of their older products very frequently. Doing your first few flights and landings in X-Plane coming from FSX is comparable to making toasts your entire life with a magnifying glass trying to focus the sun on your bread, and moving to a $600 Breville Toast maker. It's just a 100x more pleasurable, better looking and immersive experience. One more note I'd like to make is that if you have a fairly new PC (2-3 years old), but it doesn't have great graphics, you might want to take a look at X-Plane 10, the older version of X-Plane, where you will not get as amazing HDR graphics as XP11, but it is a proven solution that until very recently, all of us X-Plane pilots have used. And thanks to XP11, it is now cheaper. I also found a this comparison video, showing you the graphics of XP11 and P3D. Take it for what it's worth. The purpose of this guide is to help you get started with X-Plane 11. Any information here is completely subjective and absolutely biased based on my personal experience and the need to have at least 30 FPS in my sim with descent graphics and great simulation. I'm not an expert in sims or X-Plane. I know I purposely took some slight jabs at P3D in this thread, but it is only to spark some healthy discussion and get some counter arguments. I'm not trying to start an Apple v Android holly war . I reserve the next 2 posts for a guide on X-Plane's menus and general interface tutorial, and a gallery of 1-2 pictures from all the airports and aircraft I included. These screenshots represent real results that you can get on your sim, with descent 30+ FPS assuming you have a fairly modern system. 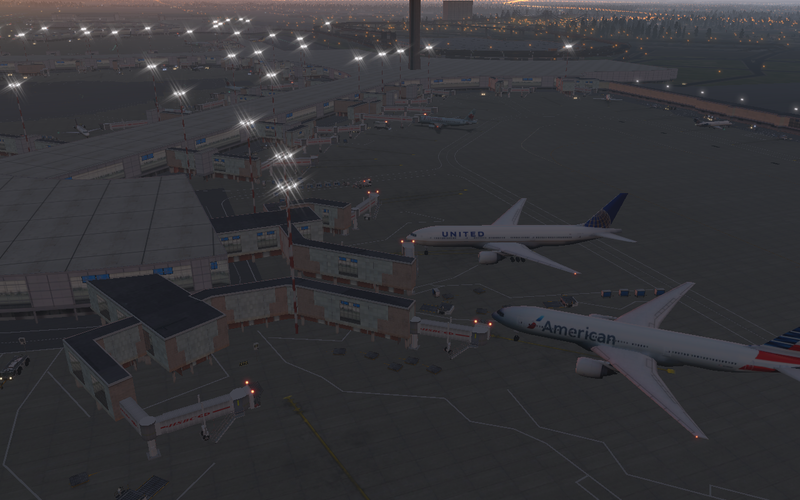 X-Plane's lighting system is gorgeous in both XP10 and XP11, but combined with XP11's HDR and improved graphics, these airports can look only better. Note: These screenshots have been published on the respective websites of all the airports listed in the previous posts. All these airports are linked to their original publisher's website and a download/buy page. If any publishers wishes me to remove these screenshots, please contact me via a private message. Creating a flight in X-Plane 11 is super easy. All you have to do is select your aircraft (1.1), your departure airport (1.2), preferred weather (1.3), and time of day (1.4). That's it. You can of course customize the chosen aircraft with a livery (2.1) and adjust fuel and balance through a custom UI (4). The cloud cover can be manually set or fetched from a server to simulate real world weather. And of course the time of the flight can be set manually or synchronized with the local time of the airport you're at. The location on the airport selector is very convenient as you can choose the position either by a gate number (4.2) or by simply looking at the chart (4.1). Once you get into the actual flight, all the menus are available by placing your mouse on the top bar. 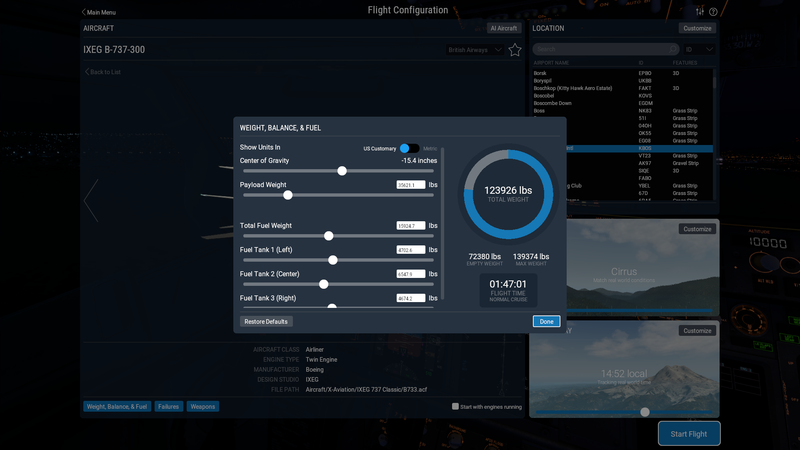 The flight menu let's you adjust your flight settings, manage fuel and balance, and edit any failures you plan for this flight (1.1). 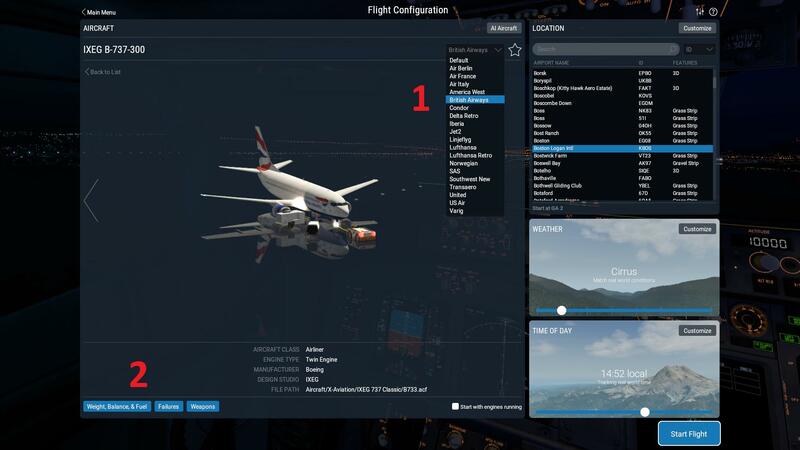 X-Plane is also known for an excellent replay system which can be accessed from the same Flight menu (1.2). Please make sure you are disconnected from the VATSIM network when you perform a replay!!! Note that you can also access the settings such as sounds, graphics, networking, etc. through icons on the top right of the menu bar (1.3). Any plugin controls such as SquawkBox (used for VATSIM connection), pushback scripts, FlyWithLua scripts and all other plugins are controlled through the Plugins menu. Additionally, the Plugin Admin plugin allows you to turn on and off any plugins while you're flying. 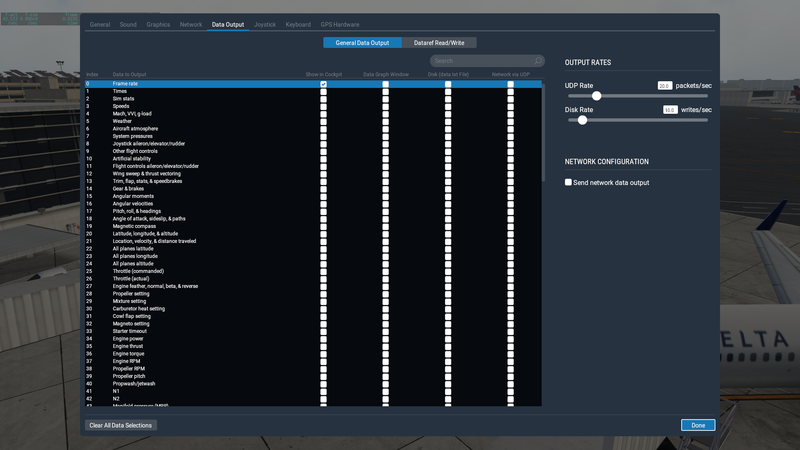 As shown above, X-Plane also has a very simple flight stick configuration interface and that can be found under options. Lastly, many people like to see an FPS counter as well as resource use statistics to see whether their CPU or GPU is the bottleneck of performance. This is especially useful when you first set up your system. This display (shown on the top left in screenshots) can be toggle from the Data Output tab under Options. Under index 0 there's an option called "Frame Rate". Toggle that on for "Shown in Cockpit" and you should be good to go. I would highly recommend BetterPushback (https://github.com/skiselkov/BetterPushbackC) over EZPushback. It allows you to plan a pushback (or pull) route ahead of time and then push exactly where you want to go with an easy, GSX like interaction after you've called for the tug. The Zibo mod for the default 737-800 is amazing. https://forums.x-plane.org/index.php?/forums/topic/111305-boeing-b738-800-modified/ It's not quite PMDG level quality but it's pretty close and the developer continues to update multiple times a week, all for free. It's absolutely a must have if you like flying tube-liners and I wouldn't bother buying anything from FF or JAR until you've checked it out. Fantastic post PI! I've always had the issue of finding everything for Xplane-11 in one place, this helps so much. "I just want to tell you both, good luck we're all counting on you." Also, a great Youtube content creator and sim-blogger has made a fantastic walk-through for those who might feel overwhelmed about taking up X-Plane. My favorite blog post of his was where he explained how he used X-Plane and P3D for different things, and he never took the "jump" as many people call it. He just expanded into another platform without replacing the other. If you haven't checked out X-Plane 11 yet I highly recommend it as well. It's like $60 (Cheaper than some addons, for a whole sim) and most of the awesome stuff in these posts are FREE. Check out this guy's website, it has a whole checklist for making X-Plane 11 get that P3D addon quality without having to spend a dime. Excellent guide! X Plane is a great simulator and i'm glad to see a well thought out and thorough starting guide. http://store.x-plane.org/732-TwinJet_p_305.html It is a joy to fly! 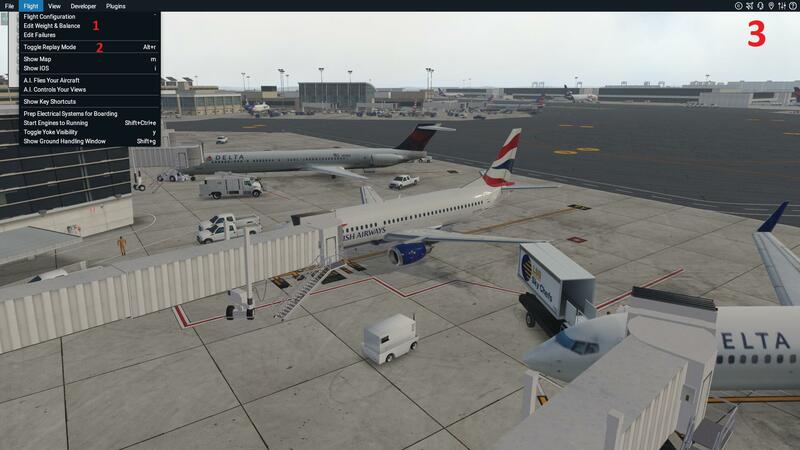 If you do pick it up I would also suggest the CIVA Navigation System add on http://store.x-plane.org/CIVA-Navigation-System_p_196.html with the CIVA Helper plugin https://forums.x-plane.org/index.php?/files/file/24566-civa-helper-plugin/ The pluggin is a huge time when working with the CIVA. The CIVA and Helper plugin can be used in other aircraft as well. Also, for all those of you who wanted to jump into X-Plane but haven't yet, right now is a great time. This is the lowest price I've seen it at yet. The offer will continue until July 5th on the Steam Summer Sale. Once again, for those of you who wanted to jump into X-Plane but haven't yet, right now is a great time. I know I keep saying this ... but now is a great time to get into X-Plane. According to the latest Navigraph poll, X-Plane 11 surpassed P3Dv4 as the most widely use sim which means you can expect even more fantastic developers coming to X-Plane in the next year. This is the lowest price it has dropped to in the past and will likely remain at this price in future sales.